Princeton economist Alan Blinder recently proposed a new government program he christened “Cash for Clunkers” in an article in The Times‘s Business section. Under the program, the government would buy back old cars at above market prices and scrap them. According to Blinder, this would accomplish a policy trifecta: 1) help the environment by getting the most polluting cars off the road; 2) stimulate the economy by getting money in the hands of people who will spend it and increase the demand for new cars; and 3) reduce income inequality by funneling the money to the poor. I am skeptical of this proposal for a number of reasons. This plan has the general feel of a gun buyback program, but instead of buying crappy old guns the government is buying crappy old cars. Still, my guess is that unless the price the government pays for the clunkers is very high, the majority of vehicles that are turned in will not have been driven much, if at all. Indeed, I suspect one of the most visible responses to this program will be a new market for mechanics fixing up cars that don’t run at all just enough so that they can be driven to the government’s lot to collect the cash. The biggest problem with this policy, however, is the way it distorts long run incentives. Let’s say the rules of the program say that a car must be at least fifteen years old to qualify for a big government subsidy to scrap it. This gives powerful incentives to people with twelve-year-old cars they were planning on scrapping to keep driving them for three more years to collect the government bounty. Instead of reducing the number of clunkers on the road, this program could actually lead to an increase! It also seems to me that any effect on the demand for new cars would be extremely limited. People who drive clunkers are generally not in the market for new cars. Presumably their replacement car will be a used car. The increased demand for used cars will lead to higher prices for used cars, which will push some buyers towards a new car, but the likely impact on new cars would be small. Finally, it is not even clear that this program would have such beneficial redistribution effects either. In the short run, it would represent a windfall profit to those who own clunkers. In the long run, however, there is a market for used cars. In response to the program, the price of nine-year-old cars would have to rise enough to offset the increased value associated with a near-clunker someday becoming a clunker that can be sold to the government. The benefits of the program will actually be spread widely over all car owners, not narrowly focused on the poor. This program highlights some general concerns that arise with government programs. The first is that policies which might be a good idea if implemented as one time, short term programs, can be much less attractive if made permanent because of the way they distort incentives. I suspect that even if this policy was introduced as a one time program, it would be extended because there would be a constituency for it. The second thing this program highlights is that it is extremely difficult to deal with negative externalities (in this case pollution) by subsidizing them (as this program does). If folks are doing things that we want less of, it makes a lot more sense to punish them for those behaviors (through extra taxes for instance) than to reward them. I would have to agree with Linda they could just check the vehicle registration in order to verify that a vehicle was currently registered to see if it qualifies to be purchased. Thus it would not lead to people fixing up cars just to cash them in. I do however beg to differ as to any great advances that have been made in making cars any cleaner in the last 15 years. I drove a geo metro that got 40mpg minimum had a catalytic converter, had a throttle body injection and an EGR valve. As far as I know they have not made anything new to cut down on emission in the last 15 years. It passed the air emissions inspections every year without a problem. So 1/1000 is ridiculous. I saw the test results and a 1 liter motor burns less fuel whether it is 15 years old or brand new so will always produce fewer contaminants, my chemistry alone tells me that. If the problem is pollution than charge people to pollute the same way that we charge companies. Couldn't you deal with the issue of age of the cars by establishing a minimum, or rather a maximum, MPG that cars have to have? In other words, if the guidelines say that the cars can't get more than 25 MPG, wouldn't that render the age of the car unimportant and thus prevent people from holding onto the cars for a few extra years? It's not like the MPG is going to magically increase, after all. And why would there be a constituency for the program over the long run? If the MPG guideline is instituted, over time, wouldn't the cars under this guideline eventually fall so that nobody would qualify? Why wouldn't someone simply drop a new fuel-efficient and low-pollution engine in an older car? Simple, the cost of doing it is greater than the value of the car. This is the same reason that many basic maintenance items get neglected as a car ages. You could easily end up with $20,000 in a car that you could only insure or sell for $1,000. The environmental advantages of maintaining and upgrading an older vehicles are significant if you consider the energy consumed and pollution created in manufacturing a new vehicle. So, why is that older vehicle only worth $1,000? Our tax code sets the depreciation schedule for vehicles used by businesses. In turn, this schedule sets the base depreciation rate for all vehicles. Sure, the actual depreciation rate that we observe for a specific vehicle will be subject to the market demand for that specific model, but average depreciation rates will track our tax code very closely. The decision about repairing or upgrading an older vehicle is usually made based on the cost of service vs. value of vehicle. The energy consumption and pollution ratings of a new vehicle always exclude the energy and pollution of manufacturing it. With all costs considered, it is probably more efficient and less polluting to repair and upgrade older vehicles. Unfortunately, we will probably keep existing financial penalties in place to prevent it. Andrew (response #57) might have the start of a good idea. Let the automakers buy back old clunkers of any brand and then give them credit towards their fleet MPG targets. Obviously the automaker would only buy a car if you buy a new car, but right now the Big 3 are hurting enough they might go for it. On the other side of the coin, the increased cost of gas is forcing the auto market to change. Ford & Gm have both put a hold on investing in new designs for their trucks. There will be plants shifting from large cars & trucks to smaller ones. May this apply to only pre- CAT vehicles except collector's cars? what about the 8 year old HD trucks? State safty or emmision inspections can and do motivate owners to maintaine their units. I drive a clunker. Since average fuel economy peaked in 1987, my clunker is more efficient than a typical new car. On top of that, the manufacturing process uses massive amounts of energy to produce each new car. Rather than being encouraged to buy one of the new wasteful cars, shouldn't I be rewarded for keeping my old one on the road? When do I get my cheque? Why is it that everyone's favorite idea (which most of the time of course only concerns other folks) is to either put new taxes in place or raise certain taxes to make 'people' do what other people (politicians or scientists paid by politicians) want them to do. Cars in Europe are smaller (= more efficient) mostly because otherwise you gonna have trouble finding a parking space. They're also cheaper, right. This is a dumb idea, and a waste of money. Yes, there are millions of old clunkers sitting in garages, driveways and back yards of homes around the country. But, few are driven regularly, many run poorly or not at all. 1) They are too lazy to sell them or don't think they will get enough to be worth the trouble. 2) The cars have sentimental value, or the owners are hoping they will start increasing in value as "classics" if they keep them long enough. Bottom line is, most of these cars are not being driven, so they can't pollute. Those that are will wear out of their own accord and will eventually be retired. The goverment squanders enough money, they don't need waste it buying up old cars. The market will take care of them on it's own. This idea is not very green because by encouraging newer card to be purchased, we are in effect encouraging the use of raw materials to make those cars. If we evaluate the total carbon footprint of a new car versus the emissions and the previously paid carbon cost of the clunker, I'm afraid it would take a lot worse emissions than most cars produce (especially in regulated areas like California or the Northeast) to justify the total footprint of a new car. Re: scrap steel: several container ships full of scrap steel leave California ports each day. People in other countries are willing to pay more for it. This is another example of "green" obsolescence ... a modern remake of 1950s-style planned obsolescence. The implication is that you must buy a Dorkmobile model 2.0 because it has fifteen airbags and goes another ten kilometres on a tank of gas further than your old Dorkmobile model 1.0. This plan would reward narcissism and social climbing. We should be encouraging people to hang onto old cars and other consumer items through good engineering and use of superior materials. What is wrong with finding ways to upgrade older vehicles, eg. using diesel engines?. Modern vehicles are also more difficult to repair which makes DIY work harder. 1) If you define "clunkers" as vehicles made before some fixed date X, then there is no perverse incentive to hold on to cars longer to qualify for the incentive. 2) The average used car on the market isn't as bad as "clunkers" that existed long ago, perhaps as far back as the pre-catalytic converter days. So, increased demand for these used cars isn't an awful thing, but an improvement. Also, the increased demand means increased price, which CORRECTS the perverse incentives by internalizing the externality of owning an older, polluting car. I have first-hand experience with one version of the California buyback program. Every couple years, older cars are forced to get a smog check at a "check only" site, that is not allowed to repair your car. If your car fails, it is eligible for a buyback program. This happened with our 1991 Honda Civic. The brakes also needed work, and we were short on cash, so we decided to cash it in for around $1000 and make do with one car. In any case, the concern that people will get junkers just to cash them in with the state can be eliminated by limiting the frequency with which cars can be turned in. In California, you can only cash in a car every two years. The program seems to have a good track record of removing the most polluting cars from the road, my example notwithstanding. Who was that who said we ought to tax cars at a higher rate as they got older rather than the other way around thusly encouraging people to drive the newer more efficient vehicles. 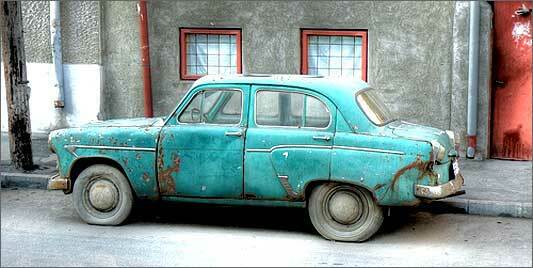 A car should be junked as soon as its net present value as a car is lower than its net present value as junk. If the markets don't recognize some of the costs and benefits on either side of that comparison, then there's some basis for a program that compensates for that. To me, the ultimate in recycling is driving a vehicle till it won't be coaxed another inch. I have a 1996 minivan (presently in the shop for repair). It's getting very close to wore out, but still gets over 26 miles a gallon, when driven sensibly. The Scotsman in me wants to extract at least one more year out of the vehicle. Economist call vehicle owners like myself as an"end-user". I also own a 1939 Chevrolet half-ton pickup. It is no show toy, it is stll a working truck. 15 miles a gallon, straightforward to repair, surprising parts availability, and still good for a days' work hauling firewood or water. FDR would have been proud. These old vehicles require more repair, and that ensures that auto mechanics have jobs. Finally, while I am disturbed by the decline of our nation's automakers, cutting the consumption of automobiles is a positive thing until Detroit develops a new line of durable vehicles that are either hybrids or burn alternative fuels. In Dallas we pay a penalty for the bad air quality on our inspection fees. Last winter the penalties were accrued into a fund to provide $3000 vouchers for people earning under 30k per year who traded in their 95 or older cars for ones a max of 3 years old. The program worked beautifully and I was able to get my old volvo off the road in favor of a more environmentally friendly car! Whe should look to further fund this type of program as it benefits poorer americans who drive older cars. OK, NY Times, do us all a favor. Get a your crack team of reporters to hunt down resources for us poor slobs to convert our cars to clean-running compressed natural gas (CNG). I live in a state that has a lot of it, and I could buy a Honda and a small appliance that pumps up my house supply to car pressures (3000 psig). But, it appears on the Internet that not only are there almost no shops that will do this job, it is technically illegal to modify your car's fuel system due the the pressures required. CNG is methane...one carbon, four hydrogen. Since most cars are already fuel injected these days, how about our esteemed National Laboratories promote development of CNG retrofit systems? CNG is a domestic fuel. Granted, it's not universally available, but for many places, it could be a way to remanufacture a decent used car and get something on the road for a fraction of a new car. Come on Americans, we're smart people. Lets come up with more creative ideas like this. If the govt pays above market prices, won't that just inflate the market? If not, I should be able to, in a matter of a few days or weeks, sell my barely mobile clunker for a better clunker, sell that for a something a little better, and so on until I have a car nice enough for the government to no longer take interest. Next Post »Our Daily Bleg: Will Olympic Cyclists Race Against Their Own Countrymen?